I was recently ask to make a wedding band to fit my clients 18ct white gold diamond engagement ring. Her engagement ring had 4 square diamonds as the main setting but also had small square diamonds channel set into the shank of the ring. 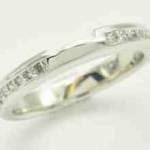 As she loved a bit of sparkle she also wanted the fitted wedding ring to have channel set diamonds to echo her engagement ring. 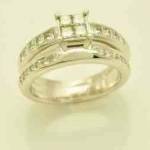 Now this was a new challenge for me as I had only previously made plain fitted wedding bands with no stones. However I love to try out new techniques and always want to push my practice further. Sometimes it is hard for clients to visualise a finished design before it is made and my client wanted to make sure the diamonds would fit in line with the diamonds in her own ring. 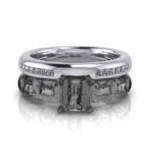 She also wanted to see how the gap and filed detail would look on the ring. 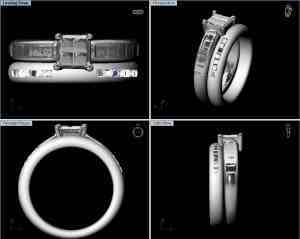 So with this commission I decided to incorporate technology and use CAD (Computer Aided Design) with the designing of the ring. This helped my client visualise how the finished rings would sit together and gave her the 3D effect of a finished piece. 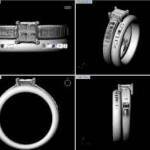 The CAD design allowed us to see how many diamonds were required to make these line up with the diamonds in my clients ring. 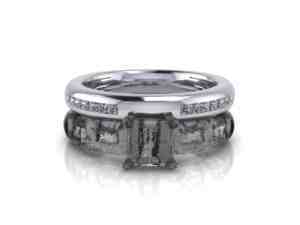 It also made me realise what thickness and size of diamonds to use in the wedding ring. I always individually hand make my commissions for my clients but for this design I wanted to go through with the whole CAD and Rapid Prototyping process. (Process which converts the CAD design into a wax model by the use of lasers). As the ring was already designed in the programme it was easy to transfer this into a wax mould due to Rapid Prototyping. I have always been torn about using computers to design and make jewellery, but with this commission it fitted in with my clients budget, time scale and was the most logical process to use on this occassion. 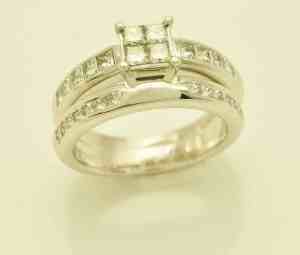 Here are images of the finished fitted wedding ring and an image with both rings so you can see how they fit together. 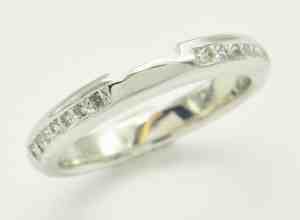 If you are interested in getting a bespoke fitted wedding ring made to match your own engagement ring then get in touch. Anything is possible and I can work around various budgets. So stand out from the crowd and get bespoke jewellery that no one else has.